I am back from Virginia, and I’ll have more to say about that later this weekend. Leah is at BlogHer. She’s moderating a panel on crafting. I miss her. Things are not the same without her. I’ve been keeping busy. I disgorged some cell phone photos to flickr. I also have done some cleaning. With all the traveling Leah, the kids, and I have done the house has fallen into some disrepair. Meanwhile, here’s me on the train today! I took the train to Burbank Airport to pick up the van, which Leah left there since I could not get home in time to take her to the airport. In the spirit of making lemonade with lemons, I took Metrolink. It was a fun mini-adventures. After that I went to Fry’s and bought a USB 2.0 PCI card for my old Mac. (Only $12.99!). It’s a G4 Desktop and came without fast USB. Go figure. Then I drove to Simi Valley and saw the Simpsons Movie. Not bad. Not great, but I laughed. The nachos were good, though I spilled cheese on my pants. “I spilled cheese on my pants” is sort of an awesome sentence. Lastly, here’s me from the train earlier. 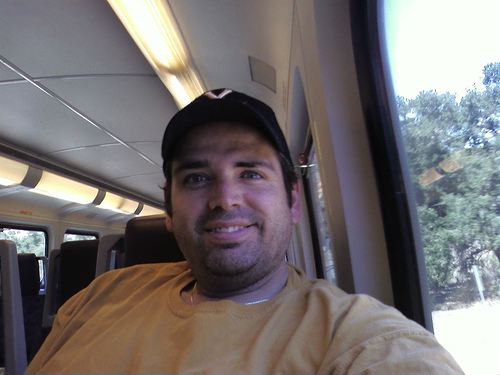 I’m unshaven, but can you tell how much I like train rides? Even short ones? Well, I do. And tunnels on train rides? Oh yeah. Tomorrow morning I’ll ride my bike to get the car from the Moorpark Train Station. Yes, everything in stages. Baby steps, a wise man once said. Baby steps. Joe Crawford blogged this at 9:47pm in 2007 in July. The 27th was a Friday. You are reading this 12 years later. Comment. There are no comments Tweet. Send email. It has hashtags→ photos .